This "Historically Speaking" column appeared in the Exeter News-Letter on Tuesday, September 17, 2013. The technological advances of the industrial revolution touched many areas of everyday life. Along with mass-produced textiles and improved transportation networks, we should not overlook how the advent of photography changed the world. We photograph nearly everything today – I’ve been known to snap a picture of my kids’ school schedule so that I’ll have it, carefully stored in my phone, for whenever I need it. It’s almost hard to imagine a world when this couldn’t be done. Imagine relying on your memory for nearly everything and the difficulty involved in describing places and people without a reliable image to prompt your memory. Wealthy people could afford to have portraits painted in the early 1800s, but ordinary people could not. The Exeter Historical Society is frequently asked if we have pictures of the town or of its people in eras when photography didn’t exist (we were recently asked if we had any photos of soldiers in uniform during the War of 1812). Sorry to say, the record is slim on images before the 1850s. In 1837, Louis Daguerre and his partner Nicephore Niepce, began experimenting with a camera obscura – a device created to reproduce art – and discovered that it could be used to record exact images. It wasn’t true photography – each daguerreotype was unique with no negative from which to reproduce the image – but it did allow an image to be recorded. It was quicker and less costly than sitting for a portrait and people marveled at this new technology. 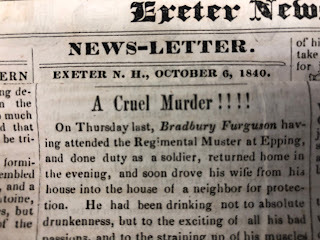 In Exeter, in 1841,advertisements for ‘Mr. Plumbe, Professor of Photography’ began running in the Exeter News-Letter. Mr. Plumbe, “proposes to instruct a limited number of Ladies and gentlemen in this beautiful and valuable art, who will be furnished with complete sets of the improved patent apparatus, by means of which any one may be enabled to take a likeness in an ordinary room without requiring any peculiar adjustment of the light.” The technology must have seemed near-miraculous to many people, since Mr. Plumbe had to explain that, “the process is simple; it requires no acquaintance with chemistry and no knowledge of drawing or painting, for the light engraves itself upon the prepared plate.” Imagine that! An image without paint or pen! It reminds me of my grandmother’s marveling at the microwave oven – cooking without heat – imagine that! Daguerrotypes and their cousins, ambrotypes, caught on quickly and it was most often portraiture that the public demanded. The reasons were quite simple and expressed eloquently in an 1847 ad; “who has not at one time or other vainly endeavored to recall the features that once reflected all our dreams of love and beauty? The smiling lip and laughing eye – the manly brow and thoughtful gaze of some dear companion, parent or friend, and sighed to think that they were lost to us forever? Who does not love, whilst pondering o’er the sunshine and shadows of the past to be able to gaze on the countenance of some dear and early loved, but now mourned and buried friend?” Tugging at the heartstrings sold a lot of pictures, it seems. But even if the language of the ad seems romantic and a bit over the top, it wasn’t hard to sell photographs. Life in the 1850s was perilous. Children died young, beloved family members sometimes moved great distances away. You couldn’t simply keep in touch through Facebook and poorly taken selfies. Freed from the high costs of sitting for a painted portrait, “at an expense so trifling that almost every person can obtain a likeness not only of himself but of every member of his family,” people in Exeter – as elsewhere – flocked to the photographer’s studio. 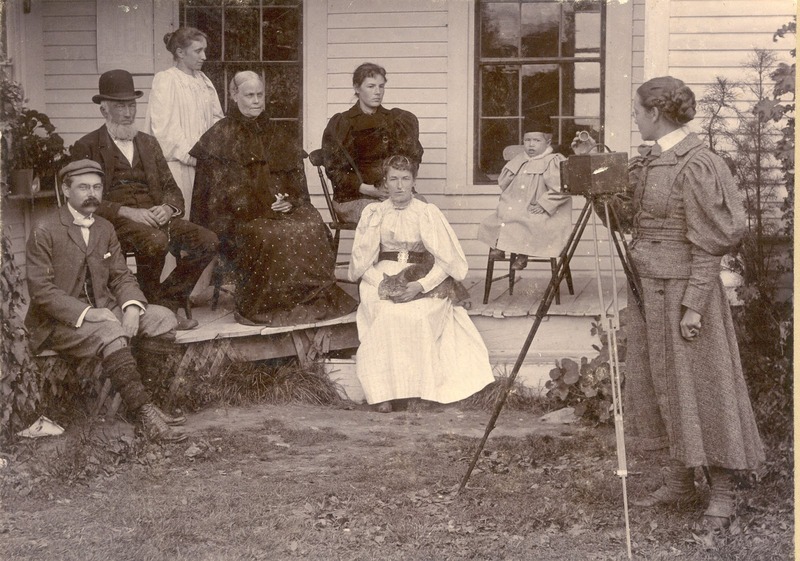 Photographs, like most new inventions, became less expensive as the technology improved. Daguerrotypes gave way to ambrotypes – both fixed on glass plates with no negative. These were superseded by ferrotypes or ‘tin types’, although as their true name suggests, they were made of iron and not tin. ‘True’ photography, pictures made from a negative image, was popularized around the time of the Civil War. Because they utilized a wet plate negative, true photographs could be easily reproduced. Matthew Brady’s war photographs, as well as his portraits of Abraham Lincoln, were reprinted thousands of times from the original negatives. Exeter’s early photographers - Thomas Boutelle, George Sawyer, the Davis Brothers and William Hobbs - set up shops all along Water Street. Davis Brothers advertised that “likenesses of sick and deceased persons can be taken at their residences.” If you happen to be leafing through old family pictures and come across photos of sleeping children, beware. They may not be sleeping. 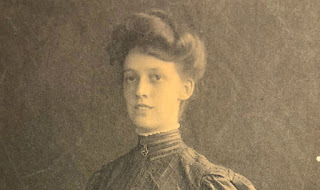 Although post mortem photographs seem morbid to us today, for grieving parents the ability to look upon the face of their deceased child was a great comfort. Until the creation of digital photography, the technology involved in taking pictures didn’t change much after the 1850s. The technology revolutionized the world not only by bringing far-away places into our homes, but by seemingly bringing the dead back to life and allowing us to see our children as babies even as they passed into middle-age.